HOURS: 9.30am to 5.00pm - 7 Days and Most Public Holidays. At XXXX Antique Complex, one of the largest suppliers of fine antiques in Australia, we pride ourselves for having a huge and wonderful selection of fine antique decor design furniture and accessories. The interior design decor antique furniture and accessories we offer will compliment all types of homes from the contemporary flat or apartment to the ever sought after period home. Fine Design Antique Furniture and stunning decor accessories such as antique and Art Deco bronze statues combined with superb antique porcelain and glass decorative items will not only be a great asset but will also offer a wonderful visual display that can be easily combined with contemporary designs. One of the most endearing qualities of fine decorative antiques is not only the quality of the craftsmanship but the long proven fact that fine quality decorative antiques can retain their value at a much greater rate than their contemporary counterparts, a very important fact to take into consideration when spending your hard earned dollars. So if you are just starting out or you are redecorating The XXXX Antique Complex is a must to visit for personal and selective shopping - the selection is huge, the quality is exceptional and all at very reasonable and acceptable prices. One of largest selections of antiques, collectables, Art Deco figurines and garden and water features in either Cast Iron or Carved Marble for sale in Victoria if not Australia. We also have a huge Automobilia section show casing one of the Australia's largest selection of antique petrol pumps bowsers and antique enamel signs that are also in our Online Shop and Store. Specializing in quality Australian and European decorative Antiques for Sale and accessories.Including a amazing selection of Old Motoring Tins + Automobilia, Antique + Old Petrol Pumps,Bowsers and a Old Antique Enamel Sign Gallery which is truly amazing and it's all for sale and is unique to Victoria, selections can be viewed on our Online Shop and Store website. The XXXX Antique Complex in Castlemaine, Victoria has one of Australia's most comprehensive ranges of Antiques, Art Deco Figures and Clocks, Automobilia,Old + Antique Petrol pumps, Old Antique Enamel Signs,Collectables, Cast Iron and Carved Marble Statues, Cast Iron and Carved Marble Water Features and Fountains, Garden Gazebos,Garden Lamps. 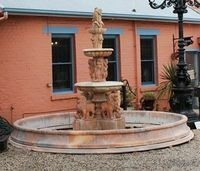 Ornamental Cast Iron and Carved Marble Urns and Garden Furniture for sale in Central Victoria, Australia. You will find a selection in our Online Shop website. We have one of the largest displays of Antiques For Sale in Victoria if not Australia with over 30,000 individual antique and collectable items in stock which are all for sale and more arriving every day, there is sure to be something to suit your tastes and budget. Please feel free to browse through the huge range of Antique and collectable items we have on display. 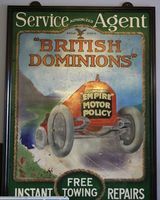 We are also proud to house one of the largest stocks of Old Antique Enamel Signs For Sale in the World, over 1000 Old Enamel Signs, a must for the Antique & Old Enamel Sign Collector. But don't forget the Old & Antique Petrol Pumps and Bowsers with some 100 in stock. Victoria's XXXX Antique Complex also houses one of the largest selections of Antique Clocks For Sale in Australia sio If you are looking for a Carriage Clock or a Long Case [grandfather clock] Clock,Grand Mother Clock, Mantle Clocks in Bronze, Spelter, Wood or Marble we have it and they are all for sale. We also carry a huge selection of Art Deco Clocks in Bronze, Art Deco Marble Clocks and Art Deco Spelter Clocks. Most Clocks are pre serviced and come with a g/tee on the Clock movement. If its a Antique Clock you want, browse our Clocks For Sale Page. For the Art Deco Lover we have a wonderful selection of Art Deco Figures For Sale, Art Deco Clocks and Art Deco Clock Sets all for sale.. In our showroom you will also find Art Deco Bronze and Ivory Figurines for sale. Art Deco All Bronze Figures and Clocks and Clock sets, We have a huge selection of Art Deco Spelter Figures and groups, must be one of the largest collections in Australia. We also have a great collection of Genuine Old Art Deco Petrol Pumps and Bowsers for sale and you will find the quality and the quantity truly amazing. If your passion is Art Deco the Deco page is a must. Our outdoor display area is one of the largest in Victoria if not Australia as we carry a huge selection of Cast Iron and Carved Marble Statues and Figures For Sale which include Water Fountains, Ornamental Garden Urns, Cast Iron Garden Lamps, Cast Iron Benches and Seats.Also we have Cast Iron Tables & Chairs, Garden Gazebos and much much more. A selection of specials will be offered for sale on our Online Shop and Store Shopping website in limited numbers. We have just recently introduced one of Australia's largest selection of Marble Garden Features and Accesseries this includes superb hand carved life size marble statues that can be used in the garden or in any indoor situation. Also for the garden we have carved marble figures of Lions, marble figures of Elephants and Bronze Deer just to name a few and its all for sale. We also have on display some stunning and substantial carved marble fountains and water features with matching pond surrounds. Also on display you will also find some exceptional finley carved Garden Urns with matching bases and all these items are on display and are for sale. Keep a eye on our Online Shop and Store Shopping website. Its only been going for a short time but its getting bigger every day. A truly International Online Shop and Store. Open from 9:30am to 5:00pm, 7 days a week and most public holidays, we are closed 3 days over Christmas and Good Friday.